It’s no secret that since my first trip to see City Stories for Londontheatre1.com (Read my review here) in October last year that I fell in love with this show, it’s cast and its creatives. Successful British singer songwriter Rosabella Gregory whose current projects sees her move towards the world of Theatre. 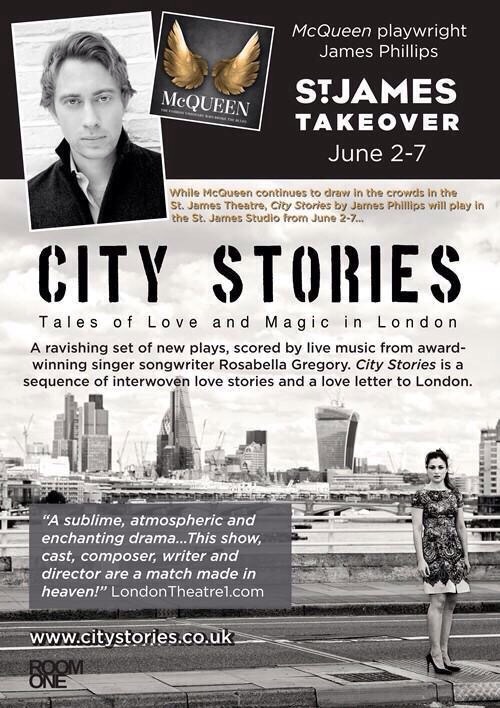 City Stories, for which she scored the music and also appears in, is a collaboration with award-winning playwright James Phillips. They recently secured a year-long residency at St James Theatre. And along with her longstanding collaborator, lyricist and twin sister, Dina Soraya Gregory, Rosabella is composing the score to a new musical, commissioned by Tony award-winning Broadway producers Brisa Trichero and Corey Brunish. Written and directed by award winning playwright James Phillips (The White Whale, The Rubenstein Kiss, Hidden in the Sand) and now the critically acclaimed McQueen the play also on at St James Theatre this is a collection of six plays which will eventually have 9 in the total repertoire. Lucy meets George at the base of the great towers at Canary Wharf. He is singing her song. He asks her to go on a quest across London to save a soul. What is the truth of time and the city? In St Pancras Station Natalie plays at the open piano. A young man approaches and tells her she is the answer to the riddle of life. Can absolute love survive? Mark is a member of a special order who work beneath St Pauls Cathedral. His job to oversee the letters which people write to God. And one day a woman comes looking for an answer to her letter. Audrey finds herself the only one awake in a London beset by a mysterious sleep plague. She goes on a journey searching for the answer. Can she find the cure? In a Starbucks below the Centrepoint Tower Vivian is approached by a stranger who tells her she knows the Great Secret of Life. In the National Gallery, David sees the lost love of his life. Her name is Pearl. Can you see the soul through the secrecy of skin? With Phoebe Sparrow and Martin Turner. As I write this I’m struck again with the feeling s that I felt in both my visits for Londontheatre1.com (read my second review here) in that this is a truly special evening of entertainment which you’d be mad to miss! I stand by my comment immortalised above in both pictures used in this article. Here’s the St James Theatre booking link so that you can witness as I have, a truly enchanting evening. 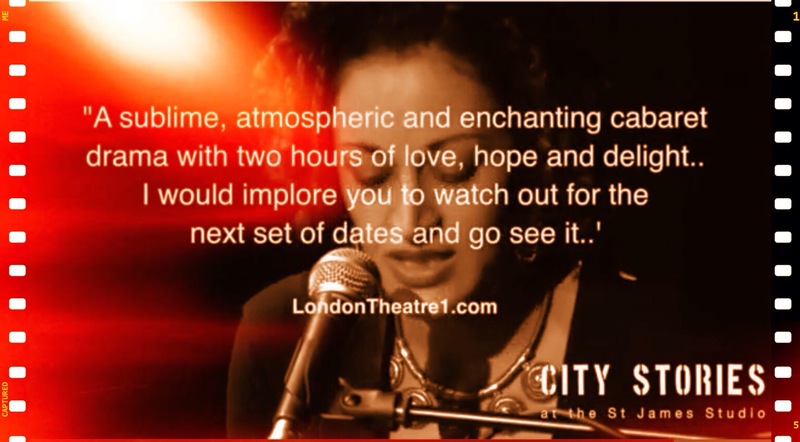 If you need any further idea of what it’s all about watch the City Stories teaser trailer here! In conjunction with this post take a look over at the interviews tab where there is an interview with Daphne Alexander who plays Audrey in the story Lullaby and James Phillips the writer/director of both this amazing piece and McQueen The Play about Alexander McQueen the designer.